The Cryonics Institute is the world’s leading nonprofit cryonics organization, offering the public cryogenic suspensions of the highest quality at the lowest reasonable cost. This has been our mission since 1976, when CI was founded by Robert C.W. Ettinger, the scientist who created cryonics, as a means to make his life-saving idea available to all. Our goal is to preserve life at liquid nitrogen temperatures until the day when medical science, nanotechnology, and other emerging or even undiscovered technologies mature to the point where our patients can be successfully revived to new life, health and even youth. Our prices are lower than any other organization — in fact, the most affordable prices anywhere in the world. This isn't surprising, it's simply keeping with our member service philosophy to provide ourselves reliable cryonic services at a reasonable and affordable cost. If we were to raise prices, as members we'd only be charging ourselves more. Does our lower cost mean lower quality patient care or services? Absolutely not. A substantial part of other organizations’ fees are earmarked for investment provisions totally unrelated to patient care and preparation. Specific methods and research differ only slightly, and we believe our procedures and policies offer the best possible chance for patient survival. To put these costs in perspective, the average heart transplant in 2010 cost $1,000,000 and came with no guarantee of success. However, given the choice between guaranteed death and an expensive procedure with a reasonable chance of success, many people will logically opt for the procedure. Similarly, cryonic suspension is a procedure that has the potential to offer people a second chance at life, and more remarkably, even after all conventional options have been exhausted. There are no guarantees though. Like a heart transplant, a cryonic suspension does not come with a guarantee of success. However, consider the guarantee implicit in a funeral – a guaranteed end to life with no second chances. A cryonic suspension cannot guarantee a new life in the future, but it does offer the very real possibility of a second chance at life. Contrasting the costs between cryonic suspension and a typical funeral, at $28,000, cryonic suspension is roughly double the $12,000 cost of a typical funeral. $28,000 may still seem like a high cost for a nonprofit organization, but it’s important to keep a few things in mind to better understand the expenses involved in a cryonic suspension and how CI’s pricing model is structured to keep those costs manageable for the average person. Our number one priority is maintaining our patients in perpetual cryonic suspension, which requires permanent storage facilities, equipment, maintenance and an indefinite amount of liquid nitrogen pending an unknown eventual revival date. Additionally, there are expenses involved in the initial cryopreservation procedure to account for, including equipment, vitrification formula and personnel. Considering these expenses in light of the perpetual nature of a cryonic suspension, one can begin to better appreciate the need for a base investment to endow into operations. Additionally, compared to other cryonics providers, CI’s prices offer significant savings which we encourage our members to use as they see fit. Members can use the savings to set up their own local standby resources or to pay for family and friends’ cryopreservations. While we certainly encourage our members to overfund and donate to help offset operational costs, we do not force people to pay beyond what we have determined is an adequate sum to get them to the future. Vitrification is a key element in ensuring an optimal suspension. Our vitrification formula has been specifically formulated to minimize ice crystal formation and structural tissue damage associated with the freezing process, resulting in superior suspensions. CI made a significant research investment to arrive at this scientifically tested formula and we share the results openly. Our open source formula is freely available so that anyone who needs it can replicate it for local standby procedures, or to conduct independent quality tests themselves. 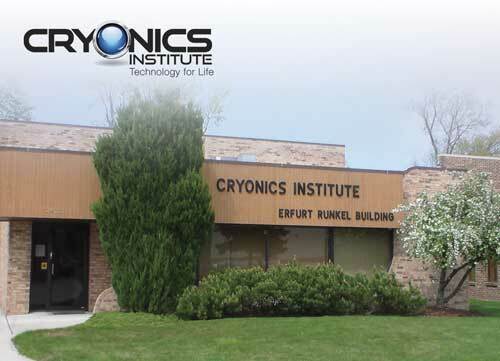 The Cryonics Institute was started by the very founder of cryonics himself, Robert C.W. Ettinger, in 1976. Since then, we have successfully cryopreserved over 100 patients, all of whom are still in perfect cryostasis today. Our long proven track record of successful suspensions makes us one of the most reliable and respected cryonics organization around. Robert C.W. Ettinger himself was cryopreserved by CI in 2011. A close examination of the late Mr. Ettinger’s own cryonics case report proves that a superior suspension need not cost as much as others would have you believe. The historical lesson to be learned in that case was that solid planning utilizing local resources trumps investing large sums of money in remote standby resources hoping that a turnkey solution will evolve. We have a unique, proven track record of financial security and stability, as well as price stability. As members, our goal is not profit, it is to provide ourselves with a lifeboat to the future at realistic and achievable cost with maximum reliability and chances of success. CI is the only cryonics organization with no debt, no stockholders, and no landlords. We own our patient care facilities outright, and all of our member officers and directors donate their services voluntarily. We're one of the oldest cryonics organizations in existence -- and the only such organization that has never raised its prices, even in high-inflation times like the late 70s and early 80s. Adjusting for inflation, our prices have actually steadily declined, and we're committed to continuing that trend. Financially, we are the soundest cryonics organization in existence. This is a critical distinction, because as members ourselves, each and every one of us has a vested interest in the long-term viability of our organization - our facilities, cryostats and finances are built to last into the future we're striving toward. CI has also kept its paid staff to a minimum to avoid the high costs of excess labor which has caused many companies to fold under the pressure of employee self interests. CI has never had a case of embezzlement, employee corruption or worst of all, any patients lost. Through due diligence and careful examination of our personnel and procedures, CI has avoided the negative PR and lawsuits that have plagued other organizations. At CI our belief is that by keeping our prices low as funeral directors raise their prices, there will eventually be a point of price equilibrium where there is no financial disincentive to join and sign up for cryonics. While CI could easily charge and spend five times what we do on marketing and advertising we would rather charge and spend less in order to save as many people as possible. We anticipate greater growth and stability through increased membership and by helping people from all socioeconomic groups rather than only serving a wealthy few. Additionally, all of CI’s directors and officers are directly elected by and from our membership, giving our members institutional oversight and ownership. Many CI members volunteer time and resources, receiving no pay other than the pride and satisfaction of helping one another. While some organizations make centralized remote standby mandatory, CI offers this as an option available through Suspended Animation, Inc., the same organization that serves other providers. CI does not believe in a one size fits all standby solution. Instead, we encourage members to plan and set up their own decentralized local resources. We think that the ultimate responsibility for standby relies to a certain degree with the individual member, since that person knows best their own individual circumstances and how best to organize their own local network and resources. We believe that simply assuming a centralized remote team can solve all standby problems is a logistic fallacy. Cryonicists who have relied completely on remote standby without making plans locally have often suffered great ischemic injury no matter which organization they sign up with. Spending large sums of money for remote standby services, unfortunately does not guarantee a successful suspension. Members must take an active role in planning and not be lulled into a false sense of security. Robert Ettinger himself illustrated this point through the common sense cooperation between his family and friends. He also didn’t need to spend an extra $170,000 to receive an optimum suspension. Many of our members also realize they could set up an extensive and effective local standby arrangement with that kind of savings. For those who do choose a remote standby option, CI offers its members the identical SA remote standby option as other cryonics providers, but at a much lower cost. For some people, especially those who live close enough to remote standby resources, this option can make sense based on proximity and experience. Some people do not want to get too deeply involved in the intricacies of local standby, so for those who have no intention of planning or organizing local resources, CI does recommend the remote Standby option. However, when choosing to rely on remote standby it is wise to consider the question of time and distance from the remote standby team and the cryonics service provider. While it would benefit a cardiac arrest patient to have a team of medical professionals “on call” to perform CPR when needed, it wouldn’t do this patient any good if that team was two hours away and arrived too late. In contrast, a simple network of laypeople five minutes away with the capability to do CPR would have a much better chance of saving the patient. Similarly, a vast network of volunteers is the gold standard for most of the world’s rural fire and emergency medical services. In the case of cryonics, almost every city has funeral directors willing to provide quick cool down and transport to CI. The Cryonics Institute’s philosophy is that we are an ambulance service that intends to transport you to the technologically advanced hospital of the future that we believe will one day exist. We do not position ourselves as a cure for death or a future hospital, nor should we try. We fully realize it will require very advanced molecular nanotechnology to revive and fully restore the cryonics patients currently in our care. Therefore, cryonics can be seen as an experimental clinical trial where we already know the results for those who don’t participate. What the eventual results of our trial will be only the future can tell with certainty, but with the incredible advances in science and technology, we firmly believe our chances of success are good, and becoming better every day. The Cryonics Institute takes the stance that human life comes before profit. While it takes money to run CI and we would never intentionally endanger existing CI patients by excessive charity. We always inform the public of their options. To not do so we think is immoral and life-threatening to those who may not have the financial resources to sign up with more expensive organizations. We follow fair business practices and hold ourselves to the highest ethical standards. No conventional ambulance service would withhold lifesaving information or services from those in need. We encourage prospective members consider the ethics and business practices of the cryonics organizations they plan to contract with. We welcome you to shop around ask questions. When you consider the alternatives, we’re confident that you will agree we are the best, most affordable and most trustworthy cryonics organization available.